Near Kualapu’u, an up-country village on rural Moloka’i, the soil and climate combine to create perfect growing conditions for sweet potatoes. 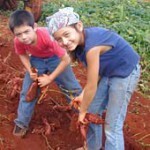 Nutrient-rich volcanic soil, abundant Hawaiian sunshine and sparkling water produce the most delicious sweet potatoes. 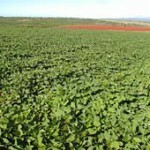 The Decoite family has been growing sweet potatoes in this beautiful environment for three generations. Grandmother Becky Mokuau began raising these wonderful tubers in the early 1960s on the family homestead and passed the growing secrets on to her son George Mokuau. 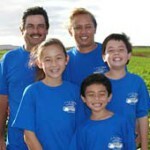 Carrying on the family traditions, George’s daughter, Lynn and her husband Russell Decoite founded L&R Farms in 2001 and with their children started producing three sweet potato varieties, Molokai Purple, Molokai Gold and the more universally common orange. Developed by the family in 1978 and grown only on Molokai, the Molokai Purple variety has acquired recent fame through introductions by famous chefs including Emeril Lagasse, Perry Bateman and Sam Choy. While the purple variety has long been a traditional part of any Molokai luau, it is now being served at commercial luaus on the other islands and on island style plates at many famous restaurants in Hawaii. USDA regulations prohibit the shipment of raw sweet potatoes to the U.S. Mainland, so in 2002 L&R Farms introduced their renowned Molokai Sweet Potato Chips as a delicious snack for residents and visitors to enjoy here and take home to friends. Prepared like regular potato chips, these unique chips are created from select sweet potatoes, which are handcrafted in small batches providing vivid eye appeal and a crisp taste of Molokai found nowhere else.